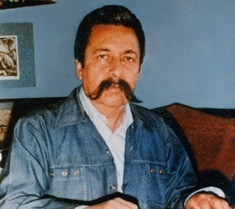 Adolfo Quinteros Gomez was born on June 1st in the city of Chihuahua, he moved to Mexico City in 1951 thanks to a scholarship from the government. He studied art at the Academia de San Carlos until 1955. He joined the Taller de Grafica Popular in 1956 and became general secretary of the organization in 1960 and again in 1963. Since 1957 he was a member of the Salon de la Plastica Mexicana. In 1959 he traveled to Czechoslovakia, the Soviet Union, Germany and Holland. He became a co-founder of the Jardin del Arte and in 1966 and 1967 it's president. That same year he left the TGP. His work has become an important piece of Mexican art history and can be seen in private collections and museums such as the Spencer Museum of Art at the University of Kansas.